From here in Maputo, across the border from South Africa, it is encouraging to read the followingreport of leadership by the UNWTO. This week we are gathered to review progress toward extending the benefits of development to people with disabilities. The upcoming seminar on Inclusive Tourism will be a specific instance of a tool for development benefitting people with disabilities. Let us hope that UNWTO will come to explicitly champion Inclusive Tourism knowing that disability is a cross-cutting issue that is both cause and effect of poverty. Global challenges, such as the recent economic crisis and the climate imperatives, can only be addressed in a global cooperative manner and in fora such as the UN or the G-20," said UNWTO secretary-general, Taleb Rifai, in his opening remarks at the Tourism Ministers' Meeting (T20) "Travel and tourism: stimuli for the global economy" (February 22-24, Johannesburg). The ministry of tourism of the Republic of South Africa, with the support of UNWTO, is hosting a Tourism Ministers' Meeting (T20) under the theme "Travel and tourism: stimuli for the global economy" from February 22-24, 2010 in Johannesburg. Tourism ministers meeting at the UNWTO General Assembly (October 2009, Astana, Kazakhstan) expressed a strong sentiment that tourism should be further mainstreamed in global economic decision-making. Travel and tourism can make a valuable contribution to the economic recovery and can be an important pillar of the global efforts to unlock enhanced economic growth, infrastructure development, trade promotion, poverty eradication, and particularly job creation. The T20 is a members-driven initiative with the support of UNWTO. Read the full speech of UNWTO secretary-general, Taleb Rifai: http://www.unwto.org/pdf/TR_T20.pdf . 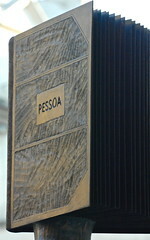 Lisbon was home to Fernando Pessoa. Fernando António Nogueira de Seabra Pessoa (Portuguese pronunciation: [f???n? ?du p??so? ]; b. June 13, 1888 in Lisbon, Portugal -- d. November 30, 1935 in the same city at the Hospital of S?o Luís) was a Portuguese poet and writer. He was also a literary critic and translator. The critic Harold Bloom referred to him in the book The Western Canon as the most representative poet of the twentieth century, along with Pablo Neruda. He was bilingual in Portuguese and English, and fluent in French. Pessoa illuminates the transcendent dynamic of inner processes in two of his poems that recently caught my attention. Funny, his meditation on a lake in "Contemplo o Lago Mudo" also evokes my recurring paradoxical experience with trees blowing in a wind but seen through a window emotionally stirring while physically separated. And, a reflection on love - here romantic love. Who doesn't know the paradox of its mute revelation? Or the discomfort of simmering in the presence of its absence? Mas n?o lhe sabe falar. N?o sabe o que há de dizer. Pr'a saber que a est?o a amar! St. Benedict's wisdom in cultivating tactiturnitas comes to mind. In O Amor Pessoa evokes the image of only two lovers while Benedict's Rule sets a praxis for a community seeking a sustainable spirituality of love. Joan Chittister shows us how words can build connections when she says that "the goal of monastic silence, and monastic speech, is respect for others. . . .
James Alison offers us a dramatic presentation of how inner and outer noise prevented Elijah from hearing God until he was plunged "into the shamed silence of one who knows himself uncovered, and for that reason, deprived of legitimate speech" (1 Kings 18-19). Elijah could not hear God's voice in the wind, earthquake or fire. And no wonder! Those phenomena echoed the inner noise that had filled Elijah with a sense of triumph when he defeated the prophets of Baal. Alison points out that what seemed to be a story of triumph turned out to be "the story of the un-deceiving of Elijah, . . . the story of how Elijah learnt not to identify God with all those special effects which he had known how to manipulate to such violent effect." What Elijah heard from the "still small voice" was what Elijah could not hear when the crowd was cheering him on to his bloody victory over Baal's prophets. He had become a mimetic double of the prophets of Baal who had brought Yahweh down to Baal's level, a level of sacrificial violence. After hearing the still small voice, Elijah went away, his zeal all but extinguished. All he did afterward was choose Elisha to be his successor, a successor who pursued his ministry with a lot more healing and a lot less violence than did his master. Such was the result of the still small voice. This visit to Portugal is unlikely to physically take me to a place I came to appreciate while buried in the archives of the Hill Monastic Manuscript Library at St. John's University one summer - the Monastery at Alcoba?a. Still, this short meander along a Benedictine stream through Portuguese culture is a satisfying consolation prize. Perhaps a potent mix of Pessoa, Benedict, and jet-lag from the flight up from Maputo will allow me at least an inclination toward taciturnitas.